The world has been programmed to see larger vehicles as gas guzzlers. Large pickup trucks, motor homes, and SUVs have always been looked at as being bad for the environment and bad on gas mileage. With word that the major automobile manufacturers of the world were contemplating adding hybrid technology to sport utility vehicles, many have looked forward to the first large size vehicle to stand out from the crowd and be fuel efficient and easier on the environment. Chevrolet was the first company to get a hybrid sport utility vehicle on the market, beating all others in this race to give the public what they wanted. The 2008 Chevy Tahoe Hybrid is the vehicle that those concerned with both fuel efficiency and environmental concerns have been waiting for. The Green Car Journal, one of the more noted environmental publications, has named the 2008 Chevy Tahoe Hybrid as the Green Car of the Year. Usually new technology or new models require a year or two on the market for them to work out the kinks before acquiring such valuable awards as this. This hybrid sport utility vehicle is available in both two wheel drive and four wheel drive varieties. Years ago it would’ve been unheard of to think of a four wheel drive SUV that embraced and made use of hybrid technology. The hybrid version of the 2008 Tahoe also comes through with relatively the same amount of power and SUV capability as the regular version, but with more efficiency than previously thought possible in a sport utility vehicle. 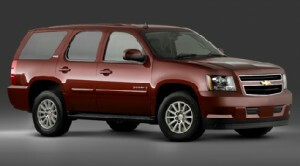 The hybrid propulsion system of the 2008 Chevy Tahoe Hybrid is designed to operate in three different ways. It can be operated under electric power, full engine power, or a combination of electric and engine power that offers new levels of efficiency without sacrificing any of attributes that people looking for SUVs insist on their vehicles having. The vehicle has the capability of painlessly utilizing its Vortec V8 when it is needed and also operate efficiently off of its two small 60kW motors that provide more than enough power to get most jobs done. The 2008 Chevy Tahoe Hybrid also offers another bonus. Using what Chevy refers to as its Active Fuel Management system, the Tahoe Hybrid can see up 50% better city fuel economy results than that of the non-hybrid model Tahoe. When you combine the massive fuel efficiency with the versatility of running on straight engine power, full electric power, or a combination of both without losing any of features drivers demand from an SUV, it is easy to see why there is so much interest in the 2008 Chevy Tahoe Hybrid. It will be interesting to see what features large hybrid vehicles come with in the future.